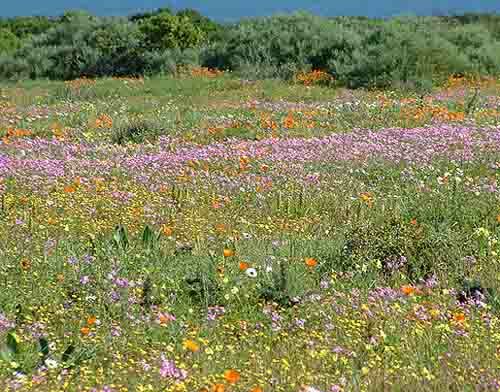 It's spring in Cape Town and the west coast is showing off its wild flowers. 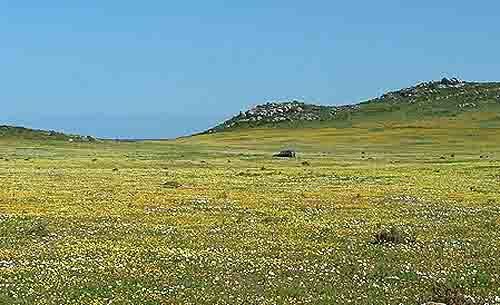 One of the areas which is in full flower at present is the area around the Langebaan lagoon and more specifically the Postberg. The southern part of the Langebaan lagoon falls into theWest Coast National Park and it is here on its western banks that we find most of the flowers. Postberg is a privately owned piece of land of about 6000 hectares inside the national park which is normally not open to the public. Every year however, between August and September when the wild flowers come into bloom the area is opened to the public to visit and marvel at the wonders of nature as it puts on its wild flower show. This year after the wonderful rains we have had in the western Cape the flower show all along the west coast is quite spectacular and no where is it better than in the Postberg. Nature is a tantalising thing and as we entered the park it started to show off its flowers, just a few here and a few there while the deeper we drove into the park the more numerous they became. On entering the Postberg area we were overwhelmed for as far as the eye could see there were wall to wall flowers in bright oranges and yellows. We were also treated to a spectacle that our forefathers must often have seen in their day and which has long since died out. However, time has stood still here in the Postberg where in the distance, grazing amongst the flowers were at least twenty of the largest eland I have seen. In the old days they would have been a hunters dream but here in the park they have been allowed to breed and form this largish herd. I have seen eland in our other parks but nowhere have I seen such a large group together. 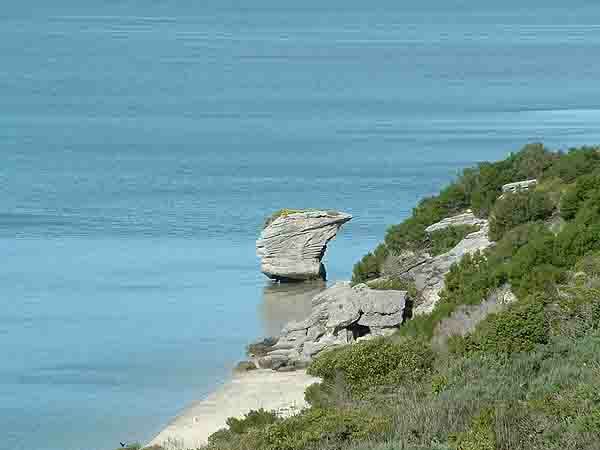 The Postberg is part of the western bank of the Langebaan lagoon and shelters the lagoon from the sea. It was along this piece of land that the Dutch and the French posted their countries flags in an effort to claim the land for their respective countries way back in the 1600's. After a number of skirmishes and removing each others flags the Dutch finally took control of the area in the early 1700's. The area became an outpost of the Dutch colony at the Cape and the mountain's name stems from that, being a mountain outpost. At the time a number of old houses were built in the area and these became known as post houses as well. Some of the older buildings and their ruins can still be found in the area. Tha Langebaan lagoon was very important to the Dutch and the French at the time as it afforded them an area where they could repair their ships without the hassles of strong winds and tides. Over the years hundreds of ships were repaired in the lagoon. In the early 1700's whales were quite numerous along the Atlantic coastline so the Dutch decided to build a whaling station in the area on the eastern coastline of the Postberg at a place called Donkergat. The whaling station did not last too long and was eventually abandoned. 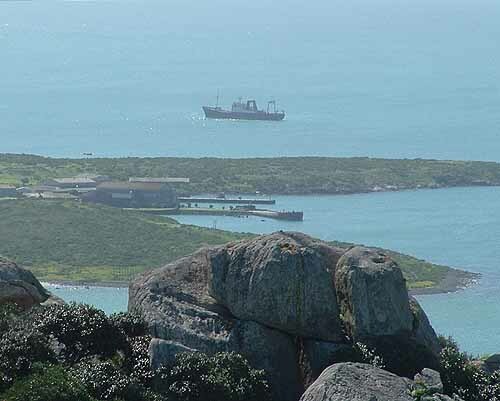 It is strange however that Donkergat became a grave to many old whaling ships that were abandoned over the years by the whaling companies who operated in the area. About thirty years ago when the Postberg was still open to the public there were a number of derelict ships anchored and sunk at the various quays at Donkergat. Since then the area has been taken over by the military and I'm not sure whether the old ships have been removed or not. It would be quite interesting if this old whaling station could have remained open to the public so that visitors could have seen some of the historical places used by the Dutch to catch our whales. Thankfully, however, whaling has been stopped and people come from near and far to see the great southern right whales lying sunning themselves off our coastlines these days. Why Postberg has been closed to the public is a mystery as the area has some fantastic views out over the Langebaan lagoon and the islands found in it. 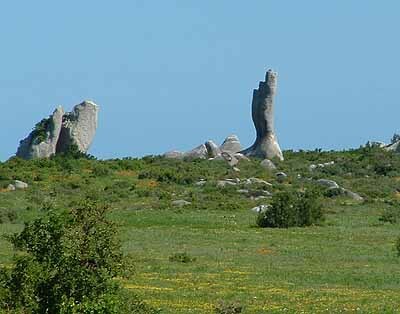 Other than the views of the lagoon, there are some rock formations on the Postberg which are quite interesting. A finger of rock pointing skywards together with other formations nearby remind one of the the rock formations found at Stonehenge in Britain. Mostly however the area is visited by boat owners during the summer months who cross the lagoon and picnic on the lovely white beaches around Kraal bay and try their hand at fishing in the channels of the lagoon, or waterski. Nearby is a wetland area known as Churchhaven and here it is as if time has stood still. The small fisherman's houses are built along the coastline and have not changed in a 100 years. Postberg and the West Coast National Park is well worth a visit especially during the flower season. For those not interested in the flowers, there are hundreds of birds that live and breed in the wetlands along the southern coastline of the lagoon. Many of them fly in from as far abroad as Russia. What a privilege it is to sit in a hide and observe the bird life going on around you. Not only is it a a stress free experience but something that will help you appreciate nature doing its thing. Why not visit the area soon.